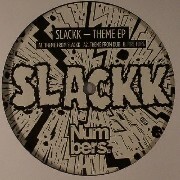 Numbers welcomes a new addition to the crew in the form of Slackk, the London dwelling professional Scouser who is single handedly breaking down the walls that seperate Detroit, Chicago and London, then picking up the pieces and moulding them into his own mutant strain of House music. Title track 'Theme from Slackk' brings back the raw aggression of the aptly named Underground Resistance classics Riot and Punisher and intermixes it with the tribal energy of UK Funky. An unlikely but utterly perfect marriage of styles for a release on Numbers. B side 'Fire Flies' is what Slackk has christened "Eski-House", his personal musical tribute to Twitter supremo Wiley. What's beautiful about this record is that Slackk knows how to move things two steps forward without ever losing track of the dancefloor. A fearless debut from a man to watch out for.